Inquest told Isle of Man TT racer Dan Kneen "died doing what he loved"
Dan Kneen with his Tyco BMW team at the Tandragee 100 in 2018. An inquest into the death of Manx motorcycling star Dan Kneen heard his Tyco BMW machine “hit a tree and burst into flames” as the Isle of Man TT racer “died doing what he loved”. 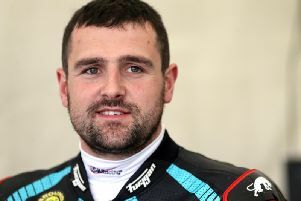 Douglas Courthouse was told the 30-year-old from Onchan, who had signed up to compete for Northern Ireland’s TAS Racing outfit last season, had been killed instantly in the crash during Superbike TT qualifying on May 30, 2018 at Churchtown near Ramsey. Manxman Dan Kneen in action on the Tyco BMW during Superbike qualifying at the Isle of Man TT in 2018. The inquest heard that the former international road race winner was off the racing line when the incident occurred as a result of high pressure being applied to the front wheel, causing it to break away. However, the court was told “it could not be determined what caused the surge in pressure”. Coroner John Needham, who recorded a verdict of death by misadventure, added it was “not entirely conclusive why the front wheel of Dan’s bike broke away”. TT winner Dean Harrison, who was behind Mr Kneen when the accident happened, estimated the crash had occurred at between 180mph and 190mph. He said he saw the bike “slide away from under” his fellow racer. The inquest heard that while Mr Kneen was pushing the 1000cc Tyco BMW machine close to its limits, the bike showed no sign of technical problems. Mr Needham described Dan as a very experienced and talented road racer who was at the top of his sport. He added that the popular Manxman had been killed instantly “engaged in what he loved to do”.